A private corporation that operates concessions at the national park claims that it "owns" the names of some Yosemite's most iconic places, including the Ahwahnee Hotel and Badger Pass. The Ahwahnee Hotel, which opened in 1927, is a National Historic Landmark. For most visitors, Yosemite National Park is far more than just Half Dome and El Capitan. Indeed, the jewel of the US national park system includes numerous iconic locales, such as Yosemite and Nevada falls, Tuolumne Meadows, and the Mariposa Grove of giant sequoias. But a large and politically influential corporation that runs concessions at Yosemite is attempting to appropriate some of the names of the park's most well known places. And if the company, Delaware North, is successful, the nation may forever lose the rights to such place names as the Ahwahnee Hotel, Badger Pass, Curry Village, the Wawona Hotel, and Yosemite Lodge. 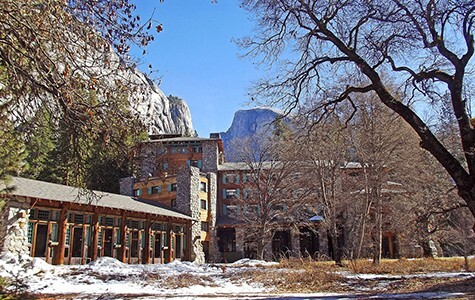 Earlier this year, Delaware North, which has held the concessions contract at Yosemite since 1993, quietly informed the National Park Service of its claim of owning the names to several of Yosemite's most famous spots, including the historic Ahwahnee Hotel in Yosemite Valley, according to park service documents. Starting on July 12, Delaware North sent a series of letters to the park service, stating that it had filed federal tradename and servicemark registrations for nearly all of the names of places within Yosemite in which it operates concessions. Delaware North's trademark claims come at a time when the park service is soliciting bids for a new concessionaire's agreement at Yosemite. Delaware North contends that if the park service decides to award the concessions agreement to another company, then the park service must pay Delaware North $51 million in "intellectual property rights" fees for the right to continue to use the names Ahwahnee Hotel, Badger Pass, Curry Village, the Wawona Hotel, and Yosemite Lodge, park documents show. "This came as a complete surprise to us," said Yosemite chief spokesperson Scott Gediman, who is also a park ranger. "We did not think [Delaware North] would claim ownership to these names. ... These names belong to the American people." Not surprisingly, Delaware North's claims are sparking outrage among California's environmental community. "The whole notion that they have the right to these names — to the Ahwahnee Hotel and to other iconic places in Yosemite — is ludicrous," said Amy Trainer, executive director of the Environmental Action Committee of West Marin. Trainer keeps close tabs on national park service issues. "It's a hijacking." Delaware North representatives did not return phone calls seeking comment for this report. On Monday, the park service extended the deadline for prospective concessionaires to submit applications for the Yosemite contract to January 21. The previous deadline was January 8. 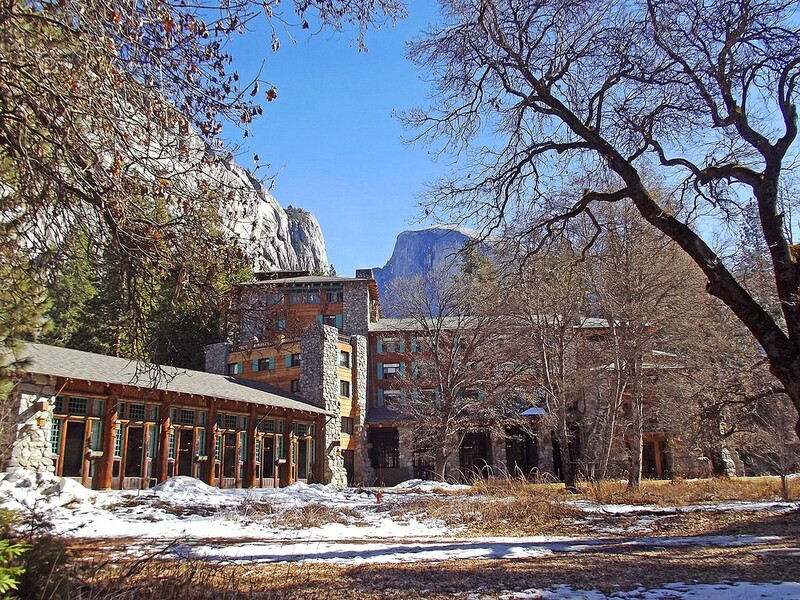 On November 20, the park service informed prospective concessionaires that, because of Delaware North's claims, the new concessionaire could choose to rename the Ahwahnee Hotel, Badger Pass, Curry Village, the Wawona Hotel, and Yosemite Lodge (with the park service's approval). That way, neither the park service nor the new concessionaire would have to worry about Delaware North's $51 million intellectual property rights claims. But if that were to happen, those world-famous locales would no longer have the names that Americans have come to hold dear. "It sounds like extortion," said Jeff Miller of the environmental group Center for Biological Diversity. "It sounds like a company that we don't want working in our national parks. I hope they don't get the new concessions agreement." To be clear, Delaware North is not laying claim to the actual places and facilities it operates in Yosemite — just to their names. But if rival companies are required to either pay $51 million to Delaware North or stop using some of the best-known place names in the park, they will likely consider the concessions agreement to be less valuable. Gediman declined to reveal the names of other companies interested in bidding on the deal, but said that Delaware North has informed its competitors of its intellectual property claims. Delaware North originally took over the Yosemite concessions agreement in 1993, signing a fifteen-year contract valued at $1.5 billion at the time. The Yosemite deal is known as the largest and most lucrative concessions agreement in the national park system. Before Delaware North, the Curry Company operated concessions at Yosemite for 94 years. But the George H.W. Bush administration ruled in the early 1990s that the Curry Company was no longer eligible for the Yosemite contract because a Japanese firm had bought it. Prior to winning the Yosemite contract, Delaware North had never before run a concessions operation in a national park. Until the early Nineties, the Buffalo-based company was best known for operating concessions at sports stadiums. Delaware North, which is now one of the largest privately held companies in North America, is owned by the billionaire Jacobs family, which has extensive holdings in New York and Florida. CEO Jeremy Jacobs also owns the Boston Bruins professional hockey team. The company also owns casinos, horseracing tracks, and greyhound dog-racing facilities, and currently holds the concessions agreements for the Grand Canyon, Niagara Falls, and the Kennedy Space Center. Federal and state campaign finance and lobbying records show that, over the years, Jeremy Jacobs and the Jacobs family have donated large sums to the Republican and Democratic parties and politicians in Washington, DC, California, New York, Florida, Arizona, and other states. California Democrats who have received big campaign donations from the Jacobs family include Governor Jerry Brown, US Senator Barbara Boxer, and Congressman George Miller. The Jacobs family also has donated thousands of dollars to Hillary Rodham Clinton, John Kerry, and Mitt Romney. Delaware North also has an infamous past. The company used to be known as Emprise Corporation when it was run by Jeremy Jacobs' father, Louie Jacobs, a racetrack kingpin who was known as the godfather of the sports betting industry, according to a 1972 Sports Illustrated exposé, "Look What Louie Wrought." When I asked Yosemite spokesperson Gediman whether he thought Delaware North was attempting to extort cash or a renewal of its concession agreement by claiming that it owns many of the park's most well known names, Gediman declined to speculate. In all likelihood, the park service will have to fight Delaware North's intellectual property claims in court if it decides to not renew the company's concessions agreement. After all, the Ahwahnee Hotel, which opened in 1927, is a National Historic Landmark, as is the Wawona Hotel, built in 1876. On Monday, the park service issued a memo to prospective concessionaires asserting that it does, in fact, own the rights to Yosemite's most famous names. But it seems clear that the park service should have issued such a memo long ago and trademarked the place names of Yosemite well before Delaware North decided to do it. When is it OK to lie about birth control?